“No work is insignificant. All labor that uplifts humanity has dignity and importance and should be undertaken with painstaking excellence.” – Dr. Martin Luther King Jr. 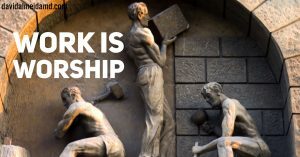 TASK AT HAND: This week I’m thinking about the old proverb, “work is worship”. It’s one that my parents taught me and one I echo frequently. However, it is also one that I commonly get dumbfounded and exasperated queries for. It is commonly questioned whether work is not merely some mechanical action relegated to a necessary compromise for material survival. So, on today’s Sunday Surgical Scrub, I will explain how I adapt this ancient teaching into a daily motivator. 1. Your work is about you. Work does not define you but, how you carry out your work, does speak volumes about your character. We need to remind ourselves that our work – whatever it may be – gives us a tremendous opportunity to develop ourselves. When you are working, you are working on yourself: your temperament, patience, equanimity, and problem solving. Therefore, this is why putting in a weak effort is so troubling. When you deny yourself effort and care in your work, you are placating a similar weakness in yourself. “If a man is called to be a street sweeper, he should sweep streets even as a Michelangelo painted, or Beethoven composed music or Shakespeare wrote poetry. He should sweep streets so well that all the hosts of heaven and earth will pause to say, ‘Here lived a great street sweeper who did his job well” (Martin Luther King Jr.). To borrow more from MLK, simply put, carry out your work as the best possible reflection of who you are. This facet of emphasis supports improvement and the creation of a culture of excellence rather than the mere production of tasks and jobs. This is where work, and how you approach it, can facilitate a spiritual connection. 2. Work is work. Sometimes, work is just work. It can be painful and frustrating. This is ok. It does not mean quit your job. It does not mean you are a terrible person. It does not mean you have to replace coworkers. It means that, sometimes, work is work. Don’t deny this feeling but accept it. This provides calm during challenging times. Moreover, it is worthwhile to remember that, if you have the skill where you are paid for a task, then it follows that you should be able to execute certain functions despite frustration and fear. 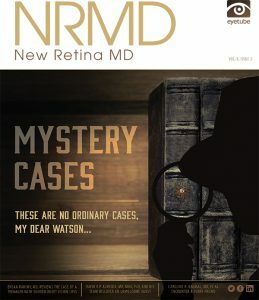 MEDICINE & MACULA: Many thanks to New Retina MD for showcasing our publication on the cover of the July 2017 Mystery Cases issue. Attachment of a deer tick to the conjunctiva is a rare event, with only a few reports in the literature. 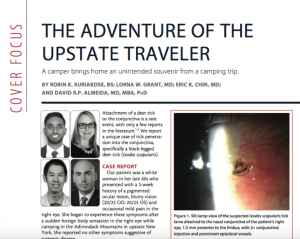 We report a unique case of tick penetration into the conjunctiva, specifically a black-legged deer tick (Ixodes scapularis). You can find the case here. 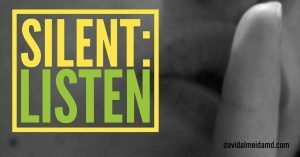 TASK AT HAND: This week I’m thinking about the silent act of listening. This underused skill serves us in two major domains. MINIMIZE SELF-TALK Self-talk comes in many forms – from self-deprecating jabs to words of encouragements – but its utility is limited. More often than not, negative self-talk can give way to dejection and apathy. Instead of turning to self-criticism, look for opportunities to listen to mind and body. This requires inner silence which allows us to gain insight and appreciate our levels of apprehension, anxiety, excitement or joy. The effort to be silent and to listen to our emotions is crucial if we are to be “in the moment”. The act of being present, requires stillness so that we reflect what our emotions are trying to communicate to us. I have never found self-talk to be of any help. As the quote from Bob Proctor so nicely states, “Don’t be a victim of negative self-talk – remember you are listening.” On the other hand, an ability to remain silent and control reactionary forces is always of use and can guide us through turbulent times. HAVE COURAGE TO LISTERN TO OTHERS Listening is a difficult and challenging skill. It takes courage to listen to others. Winston Churchill writes regarding this pursuit: “Courage is what it takes to stand up and speak; courage is also what it takes to sit down and listen.” We have archetypes of action and heroism but, let us not forget, the strength it takes to listen to others. To collaborate and effectively communicate, there must be a desire to genuinely listen, with both attentiveness and care. By the sheer frequency of times we turn to smartphones during encounters, you can see a significant weakness in our ability to connect. As a call to action, go out this week and fight the desire to interject and interrupt. Be silent and listen, and you quickly come to appreciate the wealth of knowledge available to you. At the very least, follow the words of Epictetus and aim to listen twice as much as you speak. 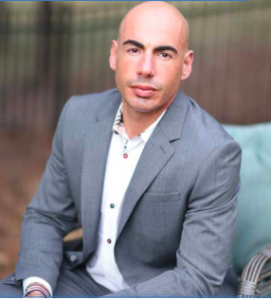 MEDICINE & MACULA: It was a real pleasure to be on the Savvy Business Radio Podcast! You can check out my interview, which aired on Thursday August 17, here. We talk about decisions, procrastination and effective entrepreneurial platforms. Check it out as well as all the other excellent past episodes available. GRATIS: Last Sunday (August 13) Citrus Therapeutics, cofounded by Eric Chin and myself, were selected as finalists for the inaugural ASRS Winning Pitch Challenge. We presented rationale for our new early phase therapeutic, CTX1, a novel agent for the treatment of age-related macular degeneration. Although we did not win, we are grateful for the feedback and honored to be on stage with a diverse group of innovative retina specialists. The “Shark Tank” atmosphere with a fantastic panel of judges and investors was a lot of fun and we look forward to more in the future. For more info, check out the Citrus Therapeutics website here. TASK AT HAND: This week I’m thinking about the logical fallacy of appeal to emotions. This occurs when emotion is manipulated to win an argument. Rather than presenting evidence or facts, emotion is used to persuade a desired viewpoint. In this fallacy of argumentum ad passions, emotion is used to weaponize opinion in place of reason. Consequently, the resultant logical construct lacks validity. 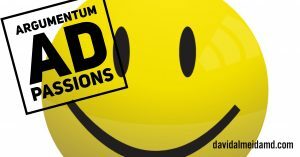 Here is an example from the good folks at logicallyfallacious.com: “X must be true because imagine how sad it would be if it weren’t true.” In reality, sadness has nothing to do with the statement for X being true or not because statements cannot, in of themselves, be sad (or happy). This fallacy is easy to spot because it will invoke emotions (e.g., sadness) for a belief in place of evidence. Another example. Politicians argue that if you vote for their opponent, their opponent will cut programs that keep you safe. The appeals to fear and safety are being manipulated. Or, one we have all seen, commercials asking you to donate money as they show you a natural disaster or a scene of poverty. Now, there is absolutely nothing wrong with helping people after an earthquake or in desperate need; on the contrary, go out and help the downtrodden! But, as far as an argument goes, what you should be considering is the charitable organization, how much of donated funds actually get to the program in question, how well positioned the organization is for outreach in the affected area, etc. Emotional appeal distorts the argument because it preys on our desire to want to agree with a vantage point. The use of emotion and persuasive language is a deceitful approach to discourse and seeks to succeed on the back of an emotional-based strategy. Don’t get emotional! Emotions are highly personal and, as grounds for an argument, cannot be verified. The biggest perpetrators are appeals to the negative emotions of fear, anxiety, anger and sadness and the positive emotion of hope. These are emotions we strongly associate with and thus create an opportunity for exploitation by those seeking to sway us. On today’s Sunday Surgical Scrub, the call to action is to recognize that emotions are powerful and can evoke great appeal to your argument; however, it must be in the context of logic and evidence. Together, evidence and emotion are superlative. But, without evidence, you have a baseless appeal to emotion that is devoid of real meaning. MEDICINE & MACULA: I’m at the American Society of Retina Specialists (ASRS) 35th Annual Meeting in Boston this weekend. Later today, we will be presenting one of our studies: “Efficacy of Intravitreal Sustained-Release 0.7mg Dexamethasone Implant For Diabetic Macular Edema Refractory to Anti-VEGF Therapy: Meta-Analysis”. Alexander Ringeisen, first year vitreoretinal surgery fellow at VRS, will be presenting. Many thanks to our coauthors Zainab Khan, Robin Kuriakose, Maryam Khan and Eric Chin. This study provides further insight into the benefits of multi-modality therapy for diabetic macular edema, the most common cause of vision loss in working age individuals. GRATIS: Also later today, Eric Chin and I – cofounders of Citrus Therapeutics – were selected as finalists for the inaugural ASRS Winning Pitch Challenge. This will take place in the main auditorium and we will be presenting our new therapeutic, CTX1, a novel agent for the treatment of age-related macular degeneration. Stay tuned for updates! TASK AT HAND: This week I’m thinking about the concepts of moral relativism and moral absolutism. Let me digress for a few sentences. This past Wednesday, I was watching one of my kids play soccer and intrigued by how little the score and the eventuality of a “winner” or “loser” was to the kids playing. Sure, they understood that whatever team scored the most goals was the winner, but the purpose of the event was beyond the outcome of a binary winner and loser. Moral absolutism refers to a set of ethics or principles that are fixed in time. In this system, there are principles that are always right or wrong and beyond debate. There is always a winner or loser based on defined criteria. Contrasting, moral relativism holds that nothing is intrinsically right or wrong, black or white; winner or loser depends on context. 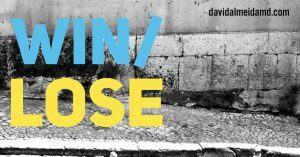 To the relativist, circumstances are crucial to uncovering the character of a person or conflict. The debate between absolutism and relativism – whether it be philosophical or cultural – is centuries old, and despite our best efforts, we will not solve it here. Instead, the goal for today’s Sunday Surgical Scrub is to make you aware of these powerful differing views that permeate significant portions of our headspace. On the one hand, the pursuits of life are beyond simply a winner and a loser. Limiting yourself to transactional interactions risks being devoid of fundamental insight into the machinations of motive and meaning. However, at the same time, one must be weary of having no absolute ideals and default to rationalizing any act. The latter has been the calling card of many oppressive societies. In my opinion, the sanguine approach is to beware the limits of binary absolute outcomes and embrace the diversity of relative viewpoints. This allows to circumvent the curt effect of a black and white world while at the same time still allow for the questioning and query essential for a just existence. MEDICINE & MACULA: Many thanks to the Journal of VitreoRetinal Diseases and the American Society of Retina Specialists for publishing one of our recent reports, West Nile Virus Chorioretinitis With Foveal Involvement: Evolution of Lesions on Optical Coherence Tomography (Gary L. Yau, Eric K. Chin, D. Wilkin Parke, Steven R. Bennett & David R. P. Almeida). It was published in the March 2017 issue of the journal and describes the clinical course of foveal West Nile virus chorioretinitis.